In the true tradition of ancient Jain Saints and scholars, Pandit Todarmalji, too, did not pay any attention towards writing anything about his life history. Therefore, nothing definite can be said on the dates of his birth, death and life span. 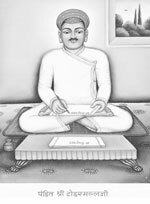 However, on the basis of the available circumstantial and other evidence Dr. Hukamchand Bharilla in his research treatise " Pandit Todarmal - life and work" established his year of birth to be 1719-20 A.D. and the year of his passing away 1766 A.D. with a life-span of only 47 years. Todarmalji was born in Jaipur (India). His father was Shri Jogidasji Khandelwal of Godika Gotra (Jain subcaste) and mother was Rambhabai. He was married and had two sons, Harishchandra and Gumaniram. Shri Gumaniram was a great revolutionary genius. Panditji received basic education in the spiritual Tera Panthi Style of Jaipur, but his deep scholarship was mainly due to hard work and genius. He was a great intellectual having sharpness of understanding and a studious nature. He was well- versed in Prakrit, Sanskrit, Hindi and Kannad languages. About his scholarship Pandit Raimalji wrote in his letter of invitation for the Indra-dhwaj Vidhana (Ritual), in the year l764 that: "It is very difficult to find a man of his intellect these days. All the doubts about religious matters are eliminated after meeting him". About his knowledge and studies, he himself writes in Moksha Marg Prakashah that, "I have studied Samayasara Panchastikaya, Prauachanasara, Niyamsara, Gomattasara, Labdhisara, Triloksara, Tattvarthasutra, with commentaries; Kshapanasara, Purushartha Siddhyupaya, Asthapahud, Atmanushasana and many other scriptures describing the conduct of monks and householders, and Puranas containing stories of great personalities according to my own understanding and knowledge". The most beautiful form of his style can be seen in his original work Moksha Marg Prakashak. Original language is Brij and has the stiffness of Khari-Boli and also local tinge. It is strong and fine enough to express his ideas and feelings forcefully. Though books numbers 2 to 6 above were written by the author separately; yet looking at their complementary nature, the author gave them a collective name as Samyagjnana Chandrika". Moksha Marg Prakashak is one of the most important original works of Pandit Todarmalji. The basis of this treatise is based not on any one Jain spiritual book but the whole of the available Jain literature. In reality, this was to be a meaningful effort of engrossing all the fundamentals of Jain philosophy and rituals; but it is regretted that this profoundly learned treatise could not be completed due to the untimely passing away of the author. In spite of being incomplete, it is acknowledged everywhere as a unique contribution to available Jain literature. This is one of the most popular books whose several editions have been published not only in Hindi, but in several other Indian languages like Marathi, Gujarati, Urdu, etc. Till date, in all, 150000 copies have been published in various languages. Besides, hundreds of handwritten copies of this book are found in the libraries of Digambar Jain Temples throughout India. In the whole of Digambar Jain Society this is the most popular Shastra for community collective reading and as a basis of sermons in regular religious congregations. The original handwritten copy in the hand of Pandit Todarmalji is also available in the famous temple at Jaipur- "Shri Deewanji Ka Mandir"- where Pandit Todarmalji used to give lecture everyday to a gathering of more than a thousand persons. This book, written in simple spoken language, is the result of the inner inspiration and pious desire of the author to enlighten those curious fellow-citizens who could not understand and get the real message of Jain philosophy and fundamentals available in intricate works written in Sanskrit and Prakrit by Jain Acharyas. No other worldly ambition has been the inspiring force behind writing this book. In the present available form, the book Moksha Marg Prakashak has nine chapters. The first eight chapters are complete but the ninth chapter is incomplete. By the manner the ninth chapter was started, it clearly seems that the subject of Right Belief was to be propounded and clarified in all its details. But alas, much could not be written. Only the nomenclatures of the eight qualities of Right Belief and twenty-five blemishes to be avoided could be listed. Their characteristics could not be described as desired. In the original manuscript, indications are available to show that the author wanted to give a second thought even to the sequence and chapter headings of various chapters. At the end of the incomplete ninth chapter, Panditji had a plan to write many more chapters. At twelve places in the available nine chapters clear indications are found to show his inner desire to throw light on various issues at appropriate places. This means that had this book been completed as per the author's hidden plan, it would have run into about five thousand handwritten pages throwing detailed light on Right- Belief, Right Knowledge and Right Conduct, the basic fundamentals of the path of liberation. The construction of sentences is brief and the style of clarification logical and analytical. Though unnecessary expansion is avoided, yet no topic is left incomplete due to brevity of style. Whatever topics are touched by the author, no aspect of the same is left un-clarified. The style is so charming and unique that even the totally unknown topic has become easily graspable. Classification of Nishchyaabhasi, Vyavharaabhasi Ubhayaa- bhasi etc. in the form of Jain misbelievers. The correct method of understanding the true meaning of Jain Shastras. The purpose of all four Anuyogas, the constitution of discourses, style of description etc. According to Pandit Bakhtawar Shah, Todarmal was arrested on a false charge of removing an idol and was executed by the order of a Jaipur ruler who was under the influence of some staunch anti-Jain individuals in the court, who had become jealous of his influence. It is a pity that this great personality who was never attracted towards amassing physical comforts and worldly achievements, became a prey of communal hatred and consequently had to sacrifice his life prematurely. It is extremely difficult and unbecoming for illustrious persons to tread the trodden path, but fewer are such personalities who find their own path and yet do not go astray. Acharyakalpa Pandit Todarmalji was one such person who did not adopt the trodden path and yet did not go astray.